Application Performance Monitoring is one key area to implement in projects to ensure proper and smooth operations from day 1. APM solutions provide development and operations team with near real-time insights on how the applications and services are performing in production, allowing for proactive tune of services, as well as for early detection of possible production issues. There are many APM solutions in the market, with diverse range of capabilities, from the inner workings of the JVM (threads in use, memory pools, garbage collection and what not) to user experience in web and mobile applications. APM solutions can also be expensive, which causes that many projects, small or short-termed, simply cannot afford one. In this series of two blog posts we will show how to leverage FOSS tools to build an APM solution, which although more limited in capabilities, may be of use for small projects. We will be leveraging ELK – Elasticsearch, Logstash, Kibana -, the Java Management Extension library (JMX) and the Spring Framework support for JMX to easily expose application data out of the JVM. NOTE: The following guide is written on ELK stack 5.2.1. Other versions may need slight adjustments to commands and/or configuration. Application events logged with a specific, known format by a logging framework. 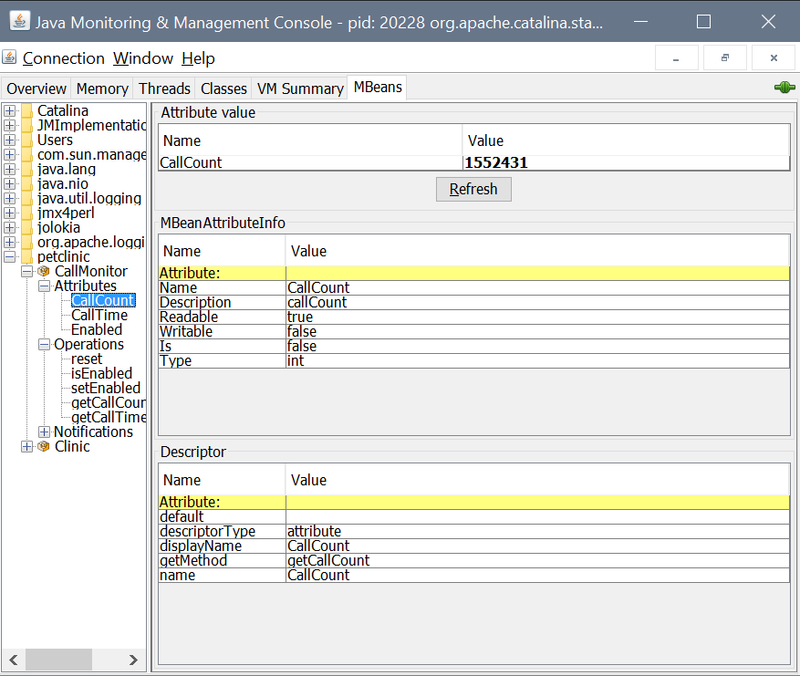 Application data which is stored by the business services in one or multiple beans (beans with shared state at the JVM level, e.g. singleton). 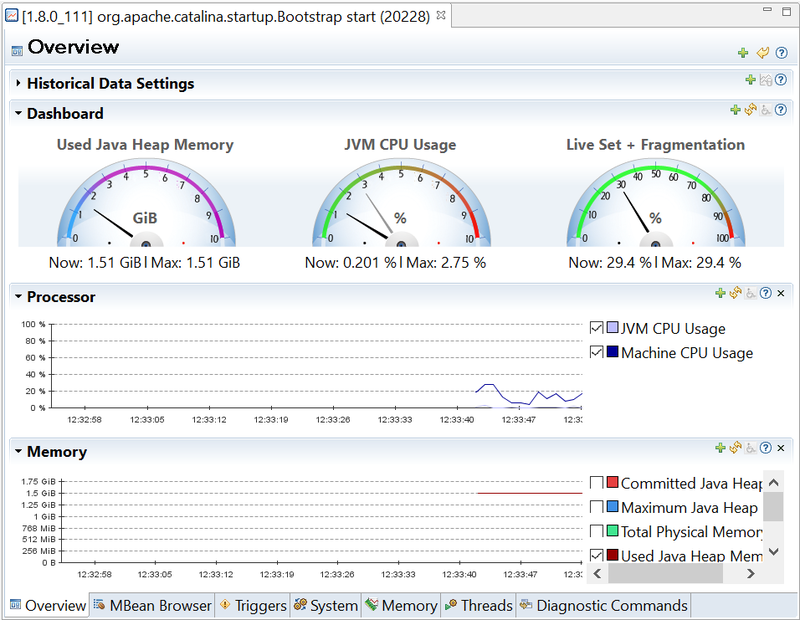 JVM performance data like memory pool usage, CPU usage, etc. Logging should be pretty familiar. Using a logging framework allows for decoupling the action of logging some event by the application code with the actual log implementation, which filters to apply (and the ability to modify them at runtime without changes in code), how to persist the log statements (disk, queues, database), etc. In terms of logging, there is little to uncover, but we need to pay attention to a couple of things that are of interest to the APM we are building: a) where are the log files located; and b) what is the format of each log statement, including which information is stored in it (e.g. timestamp, log severity, logger name/class, etc.). Application data implies two different things to consider: a) which business/application information would be useful to monitor the performance and health; and b) how to expose that information out of the runtime as a time series. JVM performance data is pretty straightforward in the case of an application running on the JVM, as the JVM already instruments many of its inner aspects and the ability to collect them requires to simply activate the publishing of them. For all three types of data we would need some mechanism to gather the data up to some central location, to index it so it is easily searchable, and finally to present it to the users in an attractive, useful way. Event logging trough slf4j and log4j 2 – although any other logging framework (either standalone or as a combination of wrapper and implementation) will suffice. Logstash to collect the data coming from all sources. Elasticsearch to index the data and provide the data access capabilities. Kibana as the dashboard where data will be visualized. In Spring Pet Clinic, the application is already logging events using slf4j and log4j 2, and collecting some application data – the number of service calls and the average time for them to complete – which are stored in a bean and published via JMX. We will reflect for a bit on how Spring Pet Clinic achieves that, as it can be seen as a best practices for real world applications. 1.1 Logging like the grown-ups! Let’s assume that it is required to log certain events occurring on the application. To do things properly, a logging framework is setup or maybe just JDK logging is chosen to be used, instead of relying of System.out and System.err streams. Once the logging framework is ready, the developers working in the project will start using the logging framework API to log events, leveraging a hierarchy of loggers (typically one logger per class) and one or several priority levels (typically FATAL, ERROR, WARN, INFO, DEBUG, TRACE or similar levels, ordered in this list from the highest priority to the lowest priority, reserved for fine grain debugging). However, is that the most optimal way of logging events? Although there will be many that require developers whit to be created, i.e. developers know better where log statements are relevant and which information is relevant to be logged, there are many others that could be bulk-logged, i.e. events every time a service is called, or events every time an exception is thrown. To do that, Aspect Oriented Programming is a perfect fit, and AspectJ is arguably the best library for doing AOP in Java. In the case of Pet Clinic, let’s leverage the CallMonitoringAspect that already exists, located in the package org.springframework.samples.petclinic.aspects. This aspect has an invoke() method which is defined to be called every time a method in a class annotated with @Service stereotype is called. By leveraging the methods in ProceedingJoinPoint and Signature classes from AspectJ API, we can write a log statement that precisely refers to service that is being invoked, by logging the service class name and method name. This approach is very elegant, and very productive as it does not require a lot of effort to trace every single service call in the application. This annotation, provided by Spring JMX support, will instruct the framework to expose the class as a JMX bean, and accordingly, methods annotated with either @ManagedAttribute or @ManagedOperation, will become available in any JMX-aware tool, as attributes or operations, respectively. Pet Clinic is already calculating the two metrics that we want to instrument: total number of service calls, and average time of service calls. These metrics are calculated in the invoke method that we already know, so it is not needed to calculate them in every single service call (which is not only unproductive, but easy to make mistakes if calculations are not consistent in every call). There are other attributes and operations available, for example to reset the metric values or to enable/disable the calculation. 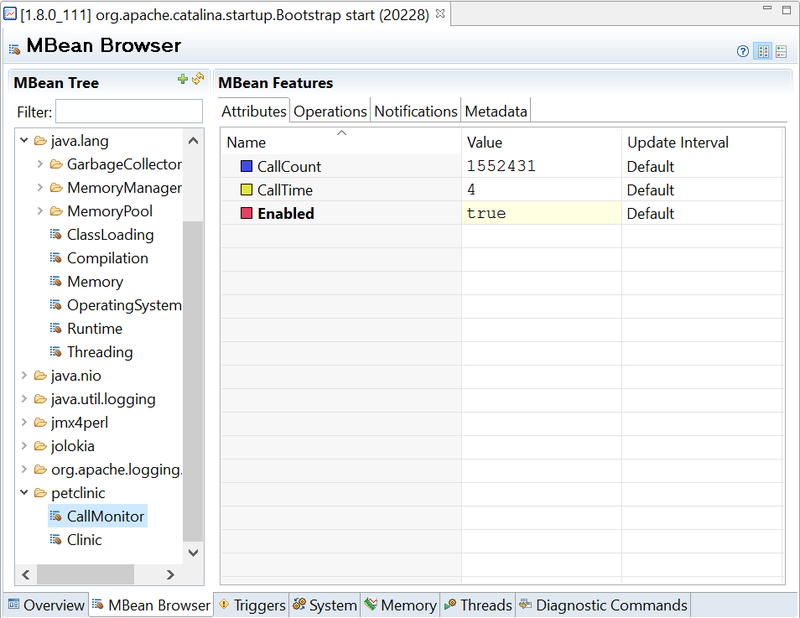 JMX interface is not enabled in Apache Tomcat by default. As we are leveraging Tomcat to run Pet Clinic, it is needed to explicitly enable JMX when Tomcat is started. 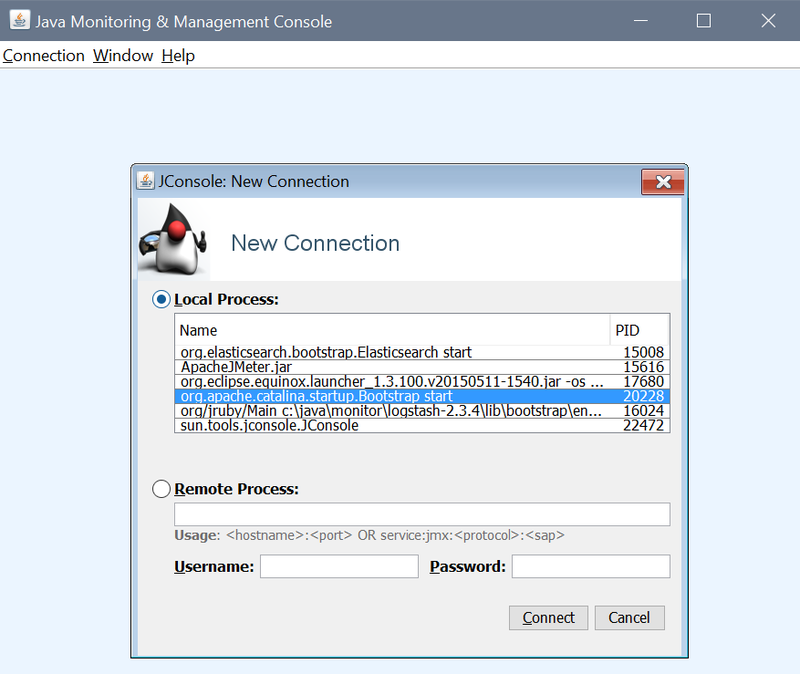 In this example, JMX interface will be available in port 28089, and security is not enabled. Please note this is not recommended for use in a production system unless the instance is properly secured inside a firewall, overlay network or other mechanism. Take into consideration that the JVM interface will be exposing internal JVM and application information (which may even be sensitive) as well as operations that may affect the way applications behave. Once Tomcat is launched with JMX enabled, you may check with any JMX-aware tool that information is exposed as expected. You may check with jconsole, VisualVM, Mission Control or Hawt.io, to name a few options. Connecting to JMX interface, initial view and Pet Clinic data, with jconsole. 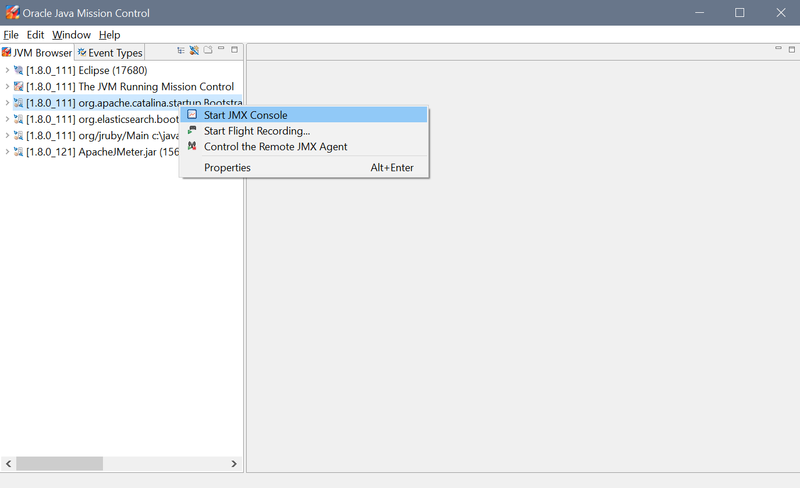 Connecting to JMX interface, initial view and Pet Clinic data, with Java Mission Control. The next step is to configure and launch Elasticsearch. Elasticsearch is the element that will ingest and index all the data. In addition to that, Elasticsearch API allows for easy, natural way of asking for data and getting results back to any consuming frontend. Extract the Zip contents to any folder of your choice. We will refer to it as ELASTICSEARCH_HOME if needed. Please note that default Elasticsearch port is 9200. The rest of configuration settings will work well for the APM we are building. Elasticsearch responding to the ‘hello world’ API call. The next piece in the puzzle is Logstash. Logstash can play many different roles as its architecture, plug-in oriented, enables the tool to collect, filter and pre-process information coming from many disparate source and in all possible formats. Extract the Zip contents to any folder of your choice. We will refer to it as LOGSTASH_HOME if needed. Before running Logstash, we would need to create the configuration file with instructions at where to look for data, filters, expected formats and other settings. The Logstash configuration file will include the instructions for all the information sources: the application log, a text file which will be parsed to extract individual tokens from the actual log message, and JMX, source for performance and application metrics. There are three sections in any Logstash configuration file: input, filter and output. Input contains the information on the data sources. Filter contains the configuration of filters and parsers to obtain the relevant information pieces from the sources. Output contains the information on the ways to publish out the collected data. Where the application log file can be found. Assigned a type name to this source of data. Useful to separate different data sources (i.e. 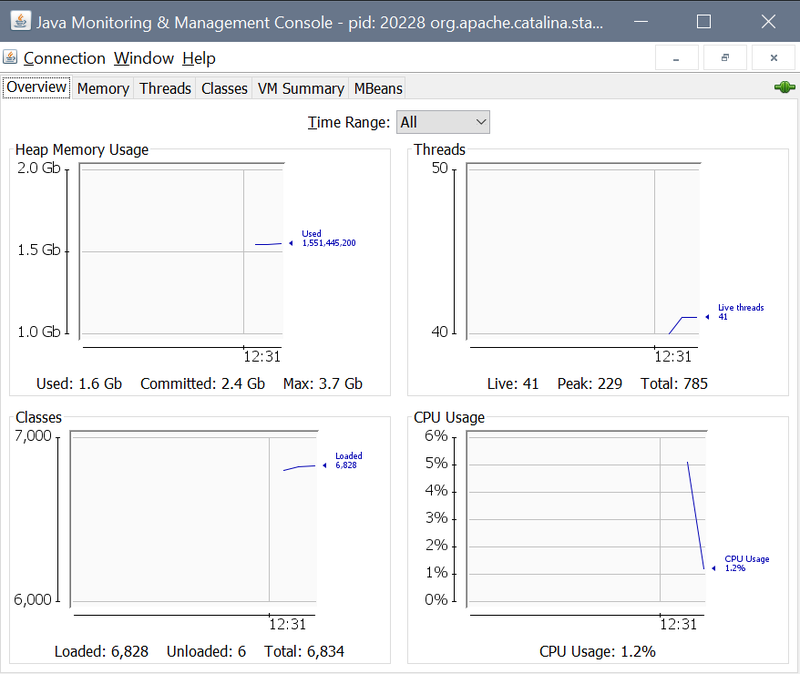 app log, server log, performance metrics), and also aggregate disparate sources of the same type (i.e. app1 log, app2, log,… appN log). Added a custom field containing the application name. Ideally, every single application or service in a system will have a distinct app-name field. When services have multiple instances (like in a high-availability cluster, or in a microservices architecture) or simply can move from one server to another, aggregating by app-name will collate all events and metrics regardless of the physical source. As it is possible that some log messages contain more than one line, the multiline codec is configured. It is considered that a new event will being when the line starts with a timestamp in ISO8601 format, and in any other case, the line will be appended to the previous to build a multiline event. The if sentence is there to ensure we apply the specific log message format only for inputs of type “log”, which is the type we configured to the input file. Different services may have different log formats, so it is always a good practice to do this, reducing the risk of parse failures. Obviously, the matcher regular expression must be aligned with the format used by log4j 2. The date entry is used to instruct Logstash that the event will leverage that field that was parsed from the log message as the timestamp for the event. By default, Logstash uses as timestamp the moment in which the event is processed, which may be different from the time when the event was produced. It usually differs only by a few milliseconds, and it is also common to have multiple events with the same timestamp. This way, the timestamp is clearer and firmly connected to the source of the event, producing less misalignments in the visualization of the logged events. With these together, let’s launch Logstash to see that everything is working fine and the log statements are read, parsed and sent to Elasticsearch. Let’s assume that the three bits of configuration above are together in a file named petclinic.conf in a folder represented by PATH_TO_CONF. Elasticsearch returning data parsed and sent by Logstash from Pet Clinic logs. In Step 3 we have configured Logstash only to read, parse and publish log messages, thus it is pending to add the JMX bits to it. The settings above will not require further explanation, except maybe for path. The path setting points not to a file, but to a directory where Logstash expects to find one or more JSON files with the JMX specific configuration. To keep things tidy, we will have two files: one for JVM performance metrics, and another for application specific metrics. Note the host name and port, which are aligned to the configuration in Tomcat. Elasticsearch returning JMX metric values from Pet Clinic. We have covered a lot in this post, but there are still a few things to do before completing our APM. In part 2, we will add the last piece to the puzzle, Kibana, the visualization tool and dashboard that we will configure, step by step, to easily consume all the data produced by our applications.